With Apple in the middle of its first month of sales of two new iPhone models, the latest figures out from Kantar Worldpanel, a market research division of WPP, indicates that going into September, sales of Android smartphones were at nearly 70% of all sales worldwide. In the last 12 weeks ending August 31, smartphones running on Google’s mobile OS accounted for over 70% of all sales across the five biggest markets in Europe (UK, Germany, France, Spain and Italy), with corresponding rises in all other major markets surveyed, including the U.S., compared to last month. However, a look at the bigger picture highlights another trend, and an opportunity for the likes of Apple, Nokia and Android OEMs who are not called Samsung. In key leading markets surveyed — U.S., UK and Australia — the share of sales to Android OEMs are actually down over a year ago (respectively now at 55.1%, 56.3% and 62.1%). And specifically, the analysts note that Samsung has seen a “dip” in sales for a couple of reasons: market saturation in mature markets; and competition from others at the lower end. 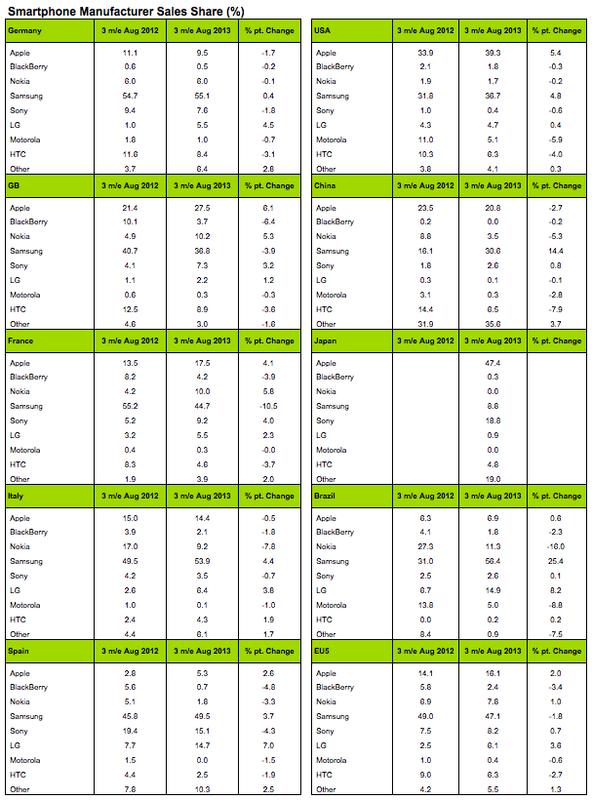 Important to note that right now Android and Samsung are at a high-enough marketshare that small declines in specific markets are not doing much to tip the balance overall. 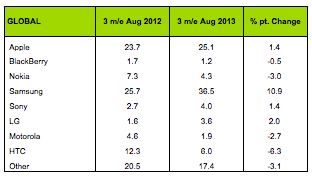 In Spain, for example, over 90% of smartphones sold in the last 12 weeks were Android handsets. In China the figure is over 72%. People have remarked about how the new 5c version of the iPhone is not the budget device some had been expecting from Apple (even if it is priced at a discount to the premium 5s model). So, notwithstanding the fact that the iPhone 4S is now seeing bargain (and often free) bundling with mobile contracts, this will leave the field open to other players who are targeting the “budget” smartphone market — that is, users in both developed and emerging markets that are more price-conscious. So far, Nokia’s aim of developing handsets to meet that latter demand has been paying increasing, if not huge, dividends, Kantar notes. It says that Windows Phone sales, as led by Nokia, are now in double digit percentages in the UK and France, at 12% and 10.8% respectively, with its share of sales in Europe’s five biggest markets at 9.2%. But other important markets like the U.S. (3% of sales) and China (2.1%) remain huge challenges for both Microsoft and Nokia on the mobile front. 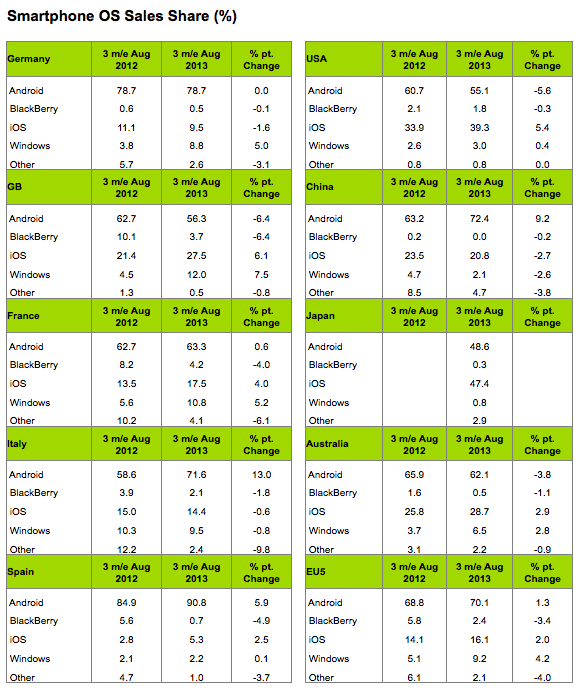 All things relative, it is still overall doing better than BlackBerry, which is now down to 0% of all sales in China, 1.8% in China, and nothing over 4.2% in any other market. While Kantar doesn’t give any indicators on early iPhone sales, we already know from Apple that sales of the two new models topped 9 million for the opening weekend, compared to 5 million for the iPhone 5 release last year. They haven’t released any numbers yet, but Kantar’s analysts hint that this is a good indication of more sustained strong sales figures for Apple. “This is set to spike in the coming months with the release of the iPhone 5s and 5c,” Sunnebo writes.